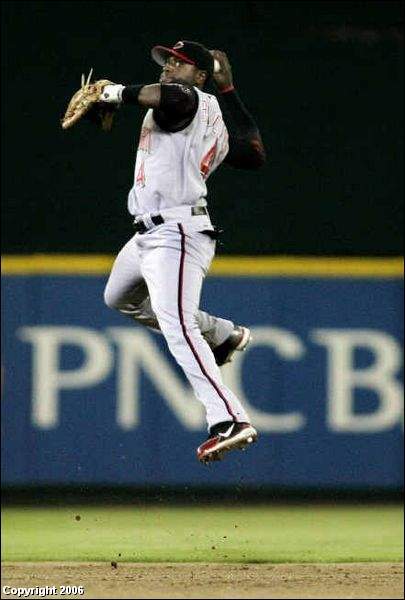 Check out the air that Brandon Phillips got in this shot (from Cinci Post). Awesome. The kid is exciting. Phillips has been very impressive thus far, and has completely outperformed my expectations. But really, who could possibly have predicted that he would win the NL Player of the Week award when we acquired him on April 7th? Cleveland GM Mark Shapiro, who is a very good general manager, has to be in agony over this deal in these early goings. While Phillips can't possibly keep playing the way he has--and he may be starting to slow, as he ended his nine-game hitting streak today--I'm optimistic that he can continue to have a reasonably productive season at the plate. It looks to me like he's won the majority of starts at 2B this season...as long as he doesn't go into a terrible slump. But that's what concerns me. When he first arrived, Phillips talked about how, in 2003, he got wrapped up in being in the major leagues, hitting home runs, etc, and that's what got him in such a bad funk. After his success these past weeks, not to mention the PotW award, I'm concerned something similar may happen. Granted, he's older and probably wiser now, but Phillips has never hit more than 15 home runs in a professional season. That was an otherwise weak 2005 AAA performance in which his K/BB nearly doubled from the prior year, going from 1.27 to 2.31 (bb-rate stayed the same, k-rate doubled). I'm just hoping that he can maintain the approach the Reds talked about when they acquired him: going to opposite field and concentrating on getting on base, all the while playing great defense. And yeah, I know I've said it before, but I wish he'd take a walk now and then. In AAA over the past few seasons, Phillips has walked every 12 or so at-bats. I was sure he was going to walk today when Mike Stanton went 3-0 on him today, but Stanton came back to get a strike and then induce a flyout to centerfield. It's not that taking a walk necessarily makes you a better hitter, but there are very few hitters who can perform well swinging at balls well out of the strike zone. If you force pitchers to throw you strikes, you have a better chance of hitting balls with authority...and hopefully a better chance at avoiding deep slumps. I'm sure the importance of this could be blown way out of proportion, but I love that Bob Castellini visited the Reds in DC this week. It's just so nice to have an owner take such an active and interested role in the ballclub. I'm sure it means a lot to the players. The guy (and his P.R. consultant) has tremendous media savvy, and also seems to have a knack for surrounding himself with competent people. Scratch one old administration mistake, and kudos to GM Wayne Krivsky for making the right call. The decision to pick up Womack was indefensible from day one, especially since it cost the team Kevin Howard, when at most it should have been doing the Yankees a favor. To Krivsky's credit, he nabbed Brandon Phillips when the Tribe gave up on him, giving the Reds an equally interesting prospect at the keystone. Add in that the Reds are replacing Womack on the active roster with a decent fourth outfield candidate in Ross, and it's a roster move with all sorts of nice little gains to brag about. Ross isn't like Phillips, a potential regular picked up before he hit the discard pile, but he does have more upside than any of the veteran stiffs the organization has had to use to stock the upper levels of their farm system. Since they're comfortable with Ryan Freel in center, I wouldn't second-guess their decision to leave Chris Denorfia in an everyday role in Louisville. As I'm writing this, I'm watching ESPN's coverage of the Pirates/Cardinals game. It's the first ESPN broadcast in the new Busch Stadium. While driving out from Ohio to Arizona with my father (and all my worldly possessions), I visited the old Busch Stadium in very early August 2001. Nice park, great atmosphere, Edmonds made a terrific diving play--typical day at the park. This new park looks spectacular though, with great views of the St. Louis skyline and, of course, the Arch in the background. It also looks like they have some sort of interesting webcast-like display in the right-field scoreboard. But one thing about this broadcast is driving my crazy. Gary Thorne, ESPN's Hockey/Baseball play-by-play man, has always been as clear and professional of an announcer as I've heard. He has good emotion in his voice as well as a consistent sense of urgency and vividness in his descriptions. But my goodness, the guy cannot pronounce Juan Encarnacion's name (from MLB's site: en-car-NAH-see-own). Steve Phillips and Steve Stone both pronounce it correctly...well, ok, so they don't do the inflection on the "r", but at least it's approximately right. But Gary Thorne says "Arn-Cah-Nae-See-Own." He did the same thing while announcing the World Baseball Classic games, and I'm beyond astonished that this hasn't been corrected yet. It's very unprofessional, not to mention irritating. And I'm not the only one to notice. Good thoughts on middle relief... makes a lot of sense. I like Billy Beanes thought on being able to manufacture closers w/ decent #'s then trading then for value (although Street seems to go against this idea). I feel like thats what we can do w/ Weathers. Yeah, it's a good idea, especially if you can do that and yet not end up trading away your best reliever. Giving Weathers all the save opportunities this season in hopes of moving him at the deadline is a smart move.